There's so many different tools for chopping food and cutting vegetables on the market today that finding the right one can be really difficult. This guide on the best food chopper for veggies was created to make it easy. We've compiled all the best options for food prep to help you find exactly what you're looking for. Our top 3 favorite vegetable cutting tools of all time. Our picks for the best manual vegetable choppers. Our picks for the best electric vegetable choppers. Our picks for the best mandolin-style veggie slicers. 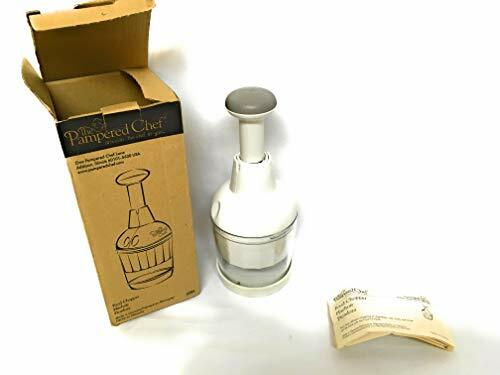 Sedhoom Manual Food Chopper – This pull string hand powered food chopper is great because it has all the pros of a food processor without all the moving parts. You can make quick work of all sorts of veggies and store them for later with the included fresh lid. 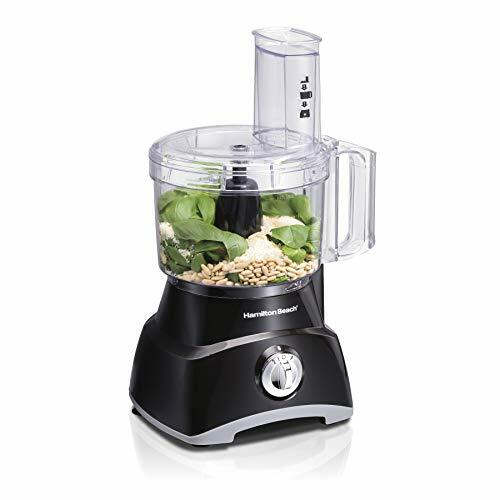 Hamilton Beach 8-Cup Food Processor – If you need to chop a bunch of vegetables as quickly as possible, this is the best unit to go for. Ideal for bulk preparation. 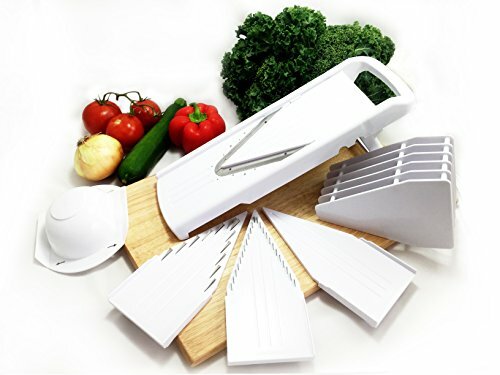 Kainnt Adjustable Mandolin Slicer – With 5 blades and an ergonomic design, this cutter/slicer will be able to deliver almost any style of cut you’d like much quicker than a knife. Manual food choppers are going to be anything that doesn't require an electrical outlet to work. They come in all different shapes, sizes, and thus function quite differently. They can be less of a commitment to work with, especially if you go for a hand held food chopper. They are great if you lose power or are taking a camping trip. They tend to be easier to clean up than other styles of vegetable prep tools. Often times, shapes of the vegetables or other foods can be a limiting factor. Pre-cutting may be required. They can be tedious and tiring to use if you're preparing food for a large group of people. If you've never seen a pull-string manual food chopper like this, you're in for a treat. The Sedhoom functions kind of like revving up a lawn mower.​ You put cut the food to the appropriate size, load it in the chopper, and pull back on the pull tab! This will cause the blades to spin, thus chopping up your vegetables. It gives you the same amount of leverage as an electric chopper, but without a huge electrical motor and cord to plug it in. Has all of the benefits of an electric food chopper without having to plug it in! It has a rather large storage capacity. Comes with a lid to keep your vegetables fresh after chopping them. Pull tab is fun to use! More moving parts than a typical hand powered chopper. Cant' do a variety of different cut styles. 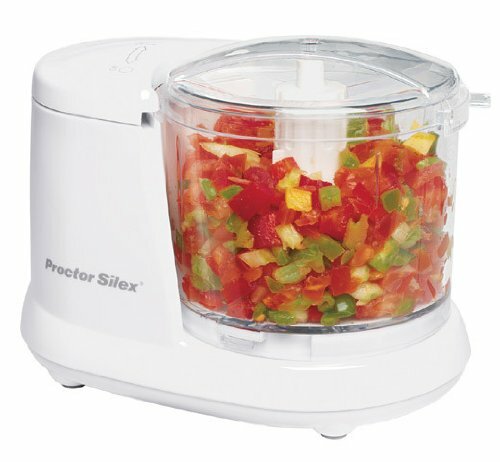 This chopper is geared at dicing fruits and veggies like onions and tomatoes, which makes it ideal for taco and salsa prep. One of its key features is that it reduces onion vapors as the container at the bottom reduces your exposure to them. The cup container at the bottom is a great way to keep food safe and fresh while you continue prepping the rest of your food. It is made from BPA-free plastic and comes with two ultra-sharp stainless steel discs for chopping and dicing even the toughest of veggies. The sharp blades mean that chopping and slicing is easy and quick and requires very little elbow grease. Note that this is a device that you use for dicing rather than slicing fruits and veggies. It handles both hard and soft produce extremely well and is a great way to prep large quantities of food in a short amount of time. It also comes with a custom built cleaning brush and a lifetime warranty. Great for salsas, tacos, and chunky spreads. Doesn't perform any slicing functions. Certain foods will have to be cut down before using. This device can be used for dicing, chopping and slicing your veggies (limited styles) and comes with 3 heavy-duty stainless steel blades. The numerous functions of this device make it great bang for your buck. The sleek, streamlined design allows you to save on storage space without compromising on versatility. The various chopping functions and sharp blades allow you to get through all sorts of produce –from cucumbers and zucchinis, to kohlrabi and celeriac. You can also use it to make French fries or hash browns. The blades are sharp enough to allow you to get through large quantities of food with little effort. You can dice or slice your onions without the risk of tears thanks to the storage container bowl that catches all your food at the bottom. It also comes with a cover, which allows you to store your veggies without switching containers. This is also dishwasher safe and easy to clean and is made from 100% BPA-free plastic. Great for prepping spreads and salsas. Storage container bowl makes it easy to save things for later. White lid has the possibility of getting stained. May have to cut down large fruits/veggies before using. Similar to the Slap Chop, the Pamper Chef hand powered vegetable chopper is the perfect combination of function and convenience. Its small enough to where its not a huge deal to take it out, and its powerful enough to chop through a bunch of vegetables in a snap. If you've never used a plunger style chopper before, it works just like you might imagine. The first step is to cut something small enough to fit under the chopper and then... SLAP, SLAP, SLAP! ​In a matter of seconds, all of the food will be roughly chopped. If you want the finished product to be a bit more fine, you can simply slap it some more. 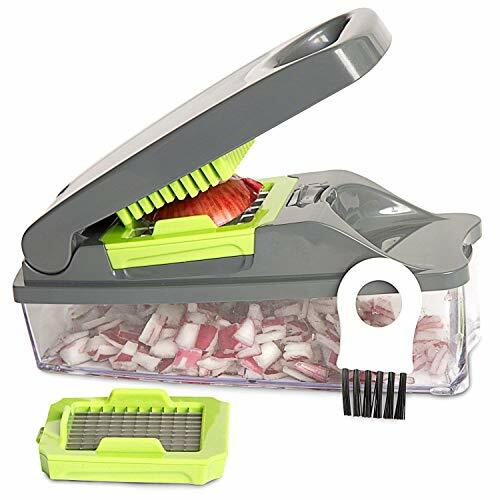 While this vegetable chopper is super effective, its main problem is that you'll have to cut the food small enough to fit under it in the first place. While it will still be a time saver compared to running a knife over everything, its definitely something to consider. Comes apart in such a way that's easy to clean. Easy to store and easy to take out to prepare something quick for lunch. The mess is encased within the unit so that food won't be flying everywhere. The slapping motion is easy and fun. Most vegetables or fruits will have to be pre-cut beforehand into smaller pieces. Can't do anything other than rough chopping. No blade versatility. This unit specializes in two things: chopping and dicing. Each one of its blades is ideal for getting vegetables or fruits chopped into different sized cubes. The way it works is simple: Cut the given vegetable into a manageable size, place on the blades, and press down.​ The chopped ingredients will fall into the storage container. While the storage basket is a bit oddly shaped, it can actually hold up to two cups. It's also got anti-skid feet attached to the bottom of it which prevent the chopper from moving it around while its in use. In addition, its dishwasher safe, BPA ​free, and comes with a small tool that makes it easy to push excess food out from between the blades. Storage basket can help keep vegetables and fruits fresh. Comes with three different chopping and dicing blades. Has a specialized blade to handle soft foods. The feet help it stay on the counter and give you the proper leverage when chopping. Most vegetables or fruits will still have to be cut into a manageable size for the chopper to handle. 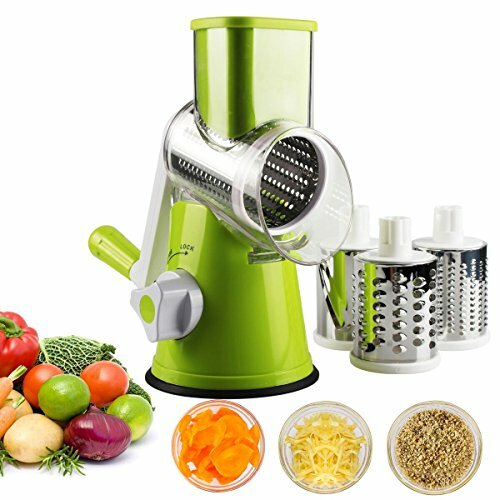 An electric vegetable chopper is perfect for the person who is doing a lot of bulk cooking or for someone who cannot handle a lot of manual kitchen work. If you've got a big family, then you know that cutting a bunch of onions for a soup can be a chore in itself. Then you've got to move onto the carrots, and the celery. By the time everything is in the soup pot, its almost bed time. Throw everything in an electric food chopper and your prep time will be greatly reduced. Dinner will be on the table at a reasonable hour and the kids will still have time for homework! Its easy to get a rough chop on things where a knife or manual food chopper would struggle, such as nuts. Many of these models can be used to perform other functions, such as grinding spices and coffee. Will work much quicker once everything is all set up. They don't require as much manual labor. Ideal for someone suffering with arthritis or limited use of their hands. A little bit of prep work is still usually required. You don't have the same amount of control as with a manual unit. It's not as easy to choose between chopping, cutting, and dicing. Washing some parts may be a bit more difficult due to electrical components. If you've got a large family, this heavy duty Hamilton Beach is going to the ideal model for you. It may looks like a traditional food processor, but it does a lot more. This electric food chopper comes with two blades: The standard S-blade to handle mixes, chops, and purees and a shredding / slicing disc. If you've ever tried to cut up an entire cabbage on the kitchen counter, then you know just how frustrating it can be. Often times, the cabbage is too big for the cutting board and the act of cutting it causes the cabbage to get all over the counter. Rather than dealing with that hassle, you can feed smaller cuts of cabbage through the chute of this machine and keep the mess contained. An invaluable tool if you need to make food for a lot of people. Can handle rough chopping as well as slicing and shredding. The clean-up is contained to the bowl of the machine. Chute allows for continuous insertion of vegetables, fruits or whatever you'll need. Can also function to make hummus, spreads, tapenades, grind coffee, and more. If you're cooking for only a few people, it may be too large. Bulkier to store than many of the other choppers on this list. 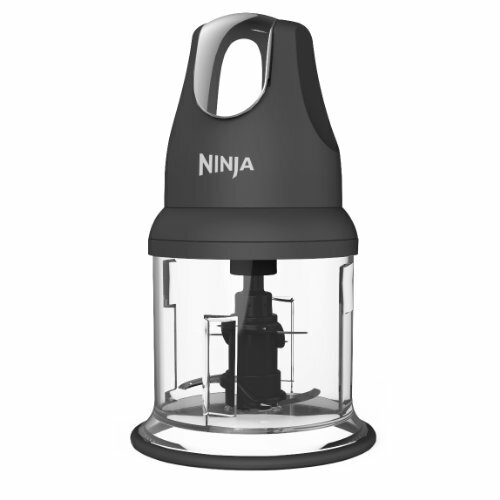 The Ninja Express Chop is simple and easy to use. It has a 16 ounce up that houses the blade and whatever food you're going to be chopping. You load in the blade, toss in the food, then attach the top part which houses the motor and the pulse button. You simply press the button on the top of the unit when you want to pulse. This is great because it allows you to move the unit around between pulses should you need to do so. Its handy if you want to tap things around to move them closer to the blades which may be necessary with electric chopping. It also ​gives you a lot of control so you can control the roughness of the chop. This lessens the likelihood that you'll turn a chunky salsa into mush by letting it run for too long. Easy to use pulse button makes it simple to control the thickness of the chop. It is portable, light, and easy to clean up. Perfect for other things besides veggies like making chopped walnuts and breadcrumbs. Capacity is rather small for large prep. The Protector Silex is a cute little food chopper which has one specialty: chopping. Much like all mini food processors, it has a ​limited capacity with the volume of the bowl being only 1 1/2 cups. If you're not skilled with a knife, making things like salsas can be quite difficult. It's hard to chop everything up into small enough pieces without having to go over everything multiple times. Additionally, doing a manual chop on a bunch of onions can be quite irritating for the eyes. 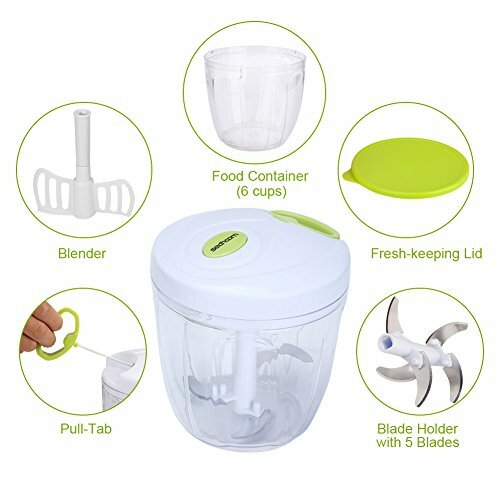 This food chopper can be a great assistant for such tasks. It's also got a small footprint and an affordable price. The only problem with this unit is its lack of blade and speed versatility. It may be difficult to get the exact cut you want. If this concerns you then go for the Hamilton Beach Food processor. A neat and compact tool, ideal for small chopping jobs. Small enough to clean easily with dishwasher safe blades. Affordable for most single individuals. Not big enough to do vegetable prep for large families. If you're not careful, vegetables may turn out finer than anticipated. May have to mix around between pulses. No blade and speed versatility. Our list of cutters and slicers are ideal for people who like to make things fancy. If you're looking to roughly chop a bunch of vegetables quickly, then these are not for you. These units are for people who want to cut with precision and have the final product be a work of art! They make it easy to cut different styles: thin slice, julienne, grating, etc. They can perform these cuts much faster than a knife (unless you're a wizard chef). That's why similar types of units are used in high volume prep kitchens. Compared to the choppers and dicers on this list, vegetable cutters and slicers simply aren't going to be as quick. They require assembly each time and process less food at once. If you're not careful, you can cut your hands should you bring the food too close to the blade. The Kainnt adjustable mandoline slicer is what you get when you cross a mandoline with an onion chopper. 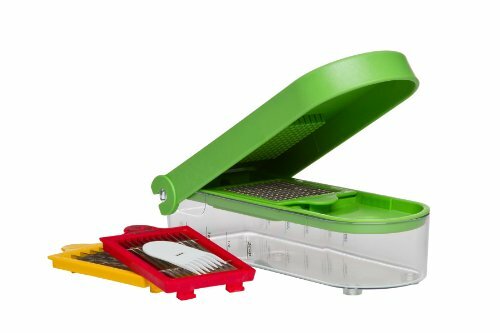 It comes with 5 interchangeable stainless steel blades that will slice, chop and julienne your food into various thicknesses and cuts. The most unique feature of this device is that it comes with a fine grating blade that can be used to grate ginger, nutmeg and chocolate for desserts, sauces and garnishes. It also comes with a coarse grater that can be used to grate carrots and beets. 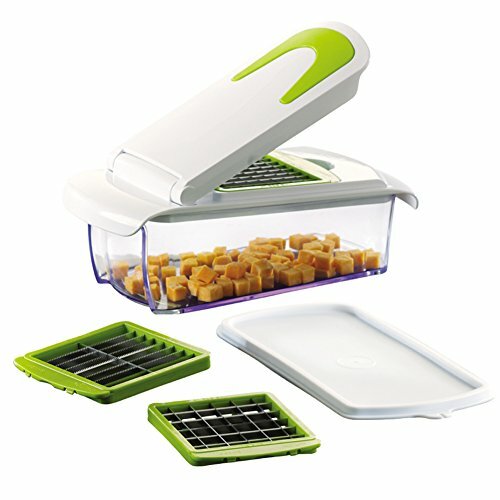 The mandoline slicer can be used to slice eggplants and zucchinis to make healthy “lasagna noodles” or potato chips. The julienne slicer is ideal for terrines and crudités. However, if you're looking for something specifically for cutting potatoes be sure to check out these sweet potato cutters. This gadget comes with a custom built cleaning brush and is made from high quality BPA-free plastic. It comes assembled and ready-to-use, making it an ideal option for people who aren’t good at assembling things. All the blades can be conveniently stored in the food container when not in use, making it a good option for people who are tight on space. 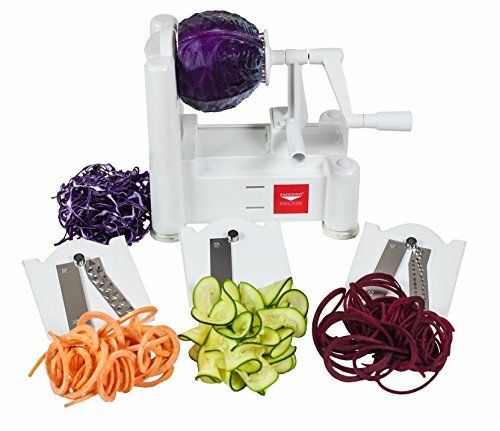 The Julienne blades make a great substitute for a vegetable noodle maker , but the real thing is always better! Works as a chopper and mandoline. Comes with 5 interchangable stainless steel blades. Ideal for performing gourmet style cuts quickly and easily. You can cut your hands if you're not careful. Not going to be as quick as some of the other vegetable prep devices we've listed. The Dynamic Chef Mandoline Slicer is so much more than just your standard mandoline. It comes with 5 different slicing options including 2 julienne blades (thick and thin), a very fine slicer, a thick slicer and a thin slicer. The stainless steel blades are sharp and reliable and cut your veggies into uniform slices quickly and efficiently. This makes it a great item if you have a large batch of food to process, especially veggie “noodles” for gluten free lasagna-inspired dishes. It is easy to store thanks to a foldable stand and the non-slip feet make it safe to use on all types of surfaces. It is also BPA-free, food-safe and comes with an ergonomic pushing tool with a protective hand guard and safety insert. There is also a blade storage rack. Besides slicing veggies, you can also slice onions and other veggies of similar consistency. This is also great for cutting bell peppers into beautifully uniform pieces and can process potatoes to make hash browns. It also slices potatoes for potato chips, apple rings for healthy snacks and can even grate and slice tough veggies like carrots and kohlrabi with very little elbow grease. It is also dishwasher safe. Can process wide variety of veggies. Ready and easy to assemble. Can cut yourself if not careful, like any mandoline slicer. Not ideal for dicing all vegetables, but can do onions. The Paderno is the only device on this list that's a functional spiralizer / zoodle maker in addition to a slicer. This doesn't slice like you might think though. Rather than creating uniform slices, the Paderno turns veggies into ribbons. This could be good or bad depending on your tastes. Powered by its high leverage crank, the Paderno comes with the ribbon blade in addition to two julienne/spiral blades. The user loads the given vegetable into the teeth, lines it up with their blade of choice, and turns the crank. Almost magically, perfectly cut or spiraled veggies fall out the other end! Makes zoodles in addition to ribbon slices. Can handle large veggies with minimal cutting (such as butternut squash). Suction base provides extra leverage. Not very useful for onions or onion vapors. Won't produce mandoline style slices. The Zactfon Drum vegetable prep machine is probably one of the most versatile on the entire list. It has the ability to shred, grind, slice all with relative ease. Less risk of cutting yourself than a regular vegetable slicer. Can perform a large variety of functions including grinding and grating. It won't reduce any onions vapors as there's no separate container. Slicing may not function as well as a traditional mandoline. Not ideal for soft items such as tomatoes. 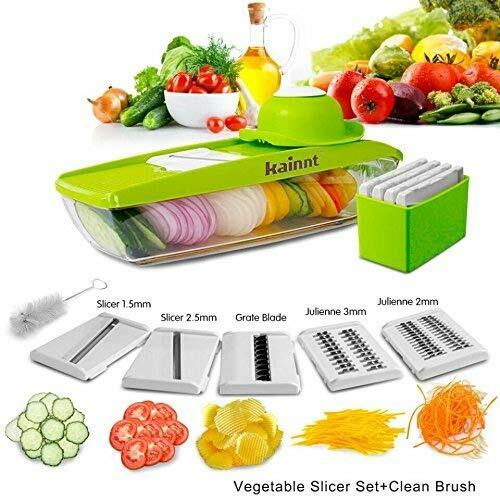 While all the models featured in this list are great at prepare veggies, the Kainnt mandoline slicer came out on top thanks to its ability to cater to people with all kinds of “vegetable processing” needs. The 5 sharp interchangeable blades, space-friendly storage capabilities and BPA-free plastic put it ahead of the pack and is likely to prove one of the most useful items in your kitchen. Finally, raw chopping and processing power for the whole family, go with the Hamilton Beach 8-Cup Food Processor. Let us know in the comments if you have other recommendations!